Chase has been telling me how much he likes to draw lately. This is very surprising as he’s never been the artsy type. He did this super elaborate drawing over the last two days, though, and now I’m starting to believe him. I can’t tell you what’s happening here but it’s a very complex story with many winners and losers. I like it. 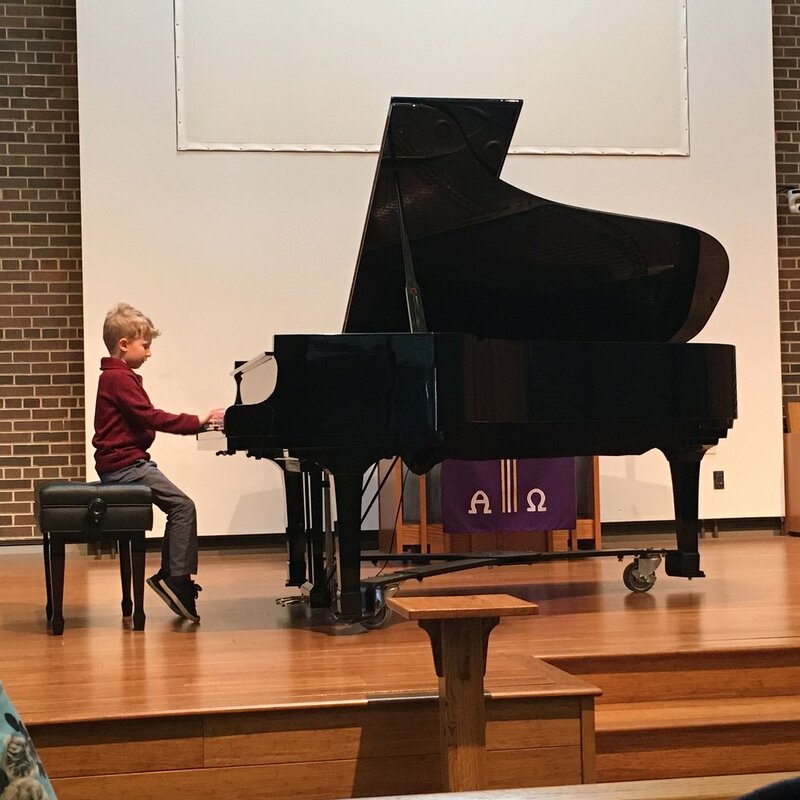 This photo was taken last Sunday before Chase’s piano recital. I’m happy to say that *I think* this is as high as the snow will get this year. The snow bank is about as tall as me—in case that’s not obvious. Luckily, we’ve had some warmer temps this week and the snow piles are receding. Now we get ready for flooding...but that’s something future Chris and Sara can worry about. The forts continued through the weekend and into today. I finally decided I couldn’t stare at the mess anymore and we put everything away. It’s nice to have the family room back. I snuck out of the house this morning for some bridesmaid dress shopping with my mom. Yep! I get to be a bridesmaid in my brother’s wedding and I’m SUPER pumped about it. I wish I lived close to them so I could go shopping with the bride, but my mom and I managed to have a great time solo. Trying on fancy dresses is so fun. I feel like there should be more reasons to try them on on a regular basis, you know? At the end of the excursion I found two dresses that I definitely like (the bride is letting us choose our own style). Now just to make the final decision. The wedding is in August so you’ll just have to wait until then for the big reveal. The little nugget has a fever [again]. Hopefully it’s just a fever and nothing else sprouts up tomorrow. Luckily, we’re on track for another stay-inside-because-of-snow day tomorrow so we’re ok with a lazy recovery day. I’m starting to think winter will never end. I wish for a world where all kids can experience the sheer joy of blanket forts. On March 1, 2019, I wrote the last entry in my one-line-a-day journal. For five years, I have struggled and fretted over this journal. One sentence every day for five years. That’s no joke. I didn’t do it every day (that was probably my problem). I would forget or be too tired and there would be days (even weeks sometimes—eek!) that I would have to use my blog to catch up on the entries. I did it, though. The journal is complete and I’m happy to have the record of the somewhat mundane but also memorable moments of our life. I’m not going to lie, though. It feels really good to check this little journal off my to-do list forever. *Side note: the journal is pictured above with the amaryllis plant that my mom gifted me and I’ve managed to rear successfully for the past few weeks. It’s huge and beautiful and a sign that maybe spring will come eventually. This is what drop off looks like at 830ish every morning: the boys pushing each other out of the way to be the first to give me a smooch before jumping out of the van. These are the moments you want to hold onto forever. And ever. I don’t read nearly as much as I’d like, but somehow when my favorite author drops a new book, I can make the time. Little Faith is officially on bookstore shelves and I’m betting it’s going to be pretty great—I’m only two chapters in so I can’t offer much additional insight. Nick is not only an amazing writer, he’s a dear friend, and also family. If you’re in the market for a new read, consider this one, will you? Day 1603 | Happy 5th Birthday! Our little nugget is five today. FIVE. I love birthdays. I love thinking back to that day of their births and how our whole world changed in one minute. I love showering them with gifts + special treats + attention. I love coming up with a day filled with whatever makes them happy. I just love it all. Robbe’s activities of choice on his big day? Present-opening immediately upon waking up, French toast for breakfast, watching Bolt (in the morning! ), mac + cheese lunch at Panera bread, attending a community theater production, serious playtime + Lego assembly, pizza for dinner (with pineapple and pickles on the side), a mystery game (created by Chris), a bingo game (created by me), and this yummy Oreo ice cream cake for desert. Add in some family to the mix and the day was pretty much perfect. He's still rocking speech therapy. At this point, Robbe is seeing the speech therapist at his school just once a week and he's surpassing all of his developmental milestones. We've got his annual IEP check-in in about a month and rumor has it he might graduate out of his IEP altogether! Potty humor gets him every time. Robbe is almost exactly the same height at 5 as Chase was when he turned 6. He loves Legos (like, really LOVES Legos), but rarely puts them together. He prefers to play with them, not assemble. It's a good thing there are other friends in the house that really enjoy the assembly part! Chase is his best friend and favorite playmate. There is nothing that brings me more joy. He can’t wait to eat lunch at school (next year). I’m worried the idea of this is not going to live up to the reality of it come next year. Snowbanks taller than a four (almost five) year old. Taller than a minivan. This is getting ridiculous. Another delayed start meant that I couldn’t make it to my Pilates session today—until my [super-sweet and overly-accommodating] teacher was willing to reschedule so the boys could come with. Now they love Pilates as much as I do! There version is a bit different than mine, but I’m pretty sure it still counts. BIGGEST HURDLE TO OVERCOME: Coming to terms with not hosting birthday parties for the boys this year. They opted to celebrate at the waterpark last weekend instead. I’m relieved and saddened to not be dealing with all that stress + excitement right now. DREAMS FOR THE FUTURE: One week of a normal schedule without sick or snow days. It’s been at least five weeks since that has happened. DREAMS FOR THE FUTURE: Losing more teeth. He’s down four already and only two have started growing back in. Even still, he’s ready for additional visits from the Tooth Fairy—I can’t imagine why. BIGGEST HURDLE TO OVERCOME: Keeping his undies un-bundled. This kid does not have time to slowly pull up his pants so that his undies lay flat and are comfortable. Instead, he pulls everything up together in a wad and then spends most of his day with bunched undies. How does that not drive him crazy?!? DREAMS FOR THE FUTURE: To be as old as (or older than) his brother. I *don’t think* this one is going to come true for the little man, but that doesn’t stop him from requesting it. He might be squinty but he’s still cute! We made it home safe and sound today. This is definitely a winter to remember. Mother Nature decided to extend our stay in Wisconsin Dells by another day so we were forced to make the most of it. We went to see the new Lego movie, stuffed our own Build-a-Bears, spent some time at the arcade, watched the Oscars, and enjoyed some family board games. Definitely better than driving in terrible weather and spending the rest of the day unpacking and doing laundry! Think happy thoughts for our trip home tomorrow. We jumped right into the water park weekend. *Pun intended. Although water parks aren’t really my thing (are you surprised? ), I couldn’t be happier to be spending the quality time with some of our favorite people. I guess I can handle some pool time for that. Are you ok with photos of photos? Cool. I appreciate that. The boys are in need of some new sun shade for our upcoming trip to Mexico. I found these cheap trucker hats online and then let the boys pick out their own graphic for them. Chase selected Shadow Lugia (a Pokemon character), obviously. Robbe’s is a Lego kit that he’s interested in. Random and humorous selections, but I like them. I printed them out on iron-on transfer paper and then added them to the hats. I’m shocked at how well they turned out. And the boys are pretty pumped, too. You can tell in this photo. I might as well offer a quick update on Chris for his big day. Now it’s a thing. He only wears white or light blue dress shirts to work. No other colors or patterns are acceptable. He worries the boys have missed their window to be great video gamers. They are 6 and 4. Let that sink in. He really likes birds of prey. He’s got some sort of radar that goes off when they are within eyeshot. It’s a pretty impressive super power. He’s terrified of pink eye. He has been since I met him. He eats peanut butter and jelly sandwiches for lunch everyday. He’s really good at board games. Like, so good I get frustrated because I never win. Luckily, he’s terrible at Speed (the card game) so that’s my confidence booster. He gets funnier with age. No one can make me laugh the way he does. He just gets me. He’s probably the best dad ever. And I’m not biased at all. The amount of energy and attention he can offer the boys after working non-stop for 11 hours is truly inspiring. I know he might not be able to offer the quantity of time he’d like to the boys, but he sure makes up for it in quality. The boys have no idea how lucky they are to have such a dedicated, caring, motivated, and funny (they think he’s hysterical, too) role model in their lives. Luckily I tell them all the time.